Do you spend more time trying to find and cut a selection for duo competition than you spend rehearsing it? Then you’ll love this gold mine, perfect for forensics and acting students and their teachers and coaches! You’ll find 35 original dramatic duets (For comedic duets, see Duo Practice & Competition), all written for one male and one female, with unique characters, hilarious situations and fresh material sure to make even the toughest judges split a gut... or at least crack a smile! Since these plays were specifically written for competition, no props are necessary, and they can be done with or without blocking. Read more... And best of all, every selection in this book fits within the eight to ten minute time limit! The language is acceptable for competition, but please note that several selections contain adult situations which some groups might feel are inappropriate for them. Still, those of high school age and older will find the subject matter refreshingly mature and true to life. ”Lhota and Milstein’s scenes are a forensics coach’s and drama teacher’s dream: intelligent, well-crafted, and most importantly, original.” — Dan Foss, Forensics Judge and Former Assistant Coach, Sandwich High School, Sandwich, IL. SPECIAL OFFER! 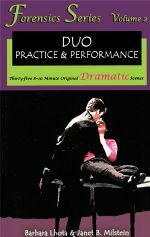 Save 10% when you buy both Duo Practice & Performance and Duo Practice & Competition for $27.00! You’ll find 35 original comedic duets, all written for one male and one female, with unique characters, hilarious situations and fresh material sure to make even the toughest judges crack a smile.